Today’s guest on Extraordinary Women Radio is one of our guest speakers at Extraordinary Women Ignite! I’m thrilled to bring you Jayne Sanders of Purpose Wisdom™. Jayne is a Purpose & Law of Attraction Coach and Master Scientific Hand Analyst. In our interview today, we talk about the importance of finding your purpose and how that can raise up the energetic forces behind us in our life and our business. Jayne’s story of transition from over 25 in the corporate world to doing the work she does today is awesome. She shares how scientific hand analysis was the catalyst that helped her find clarity – helped her find her purpose. And her life hasn’t been the same since! Hand analysis you might ask? Well, let me tell you this isn’t the palm reading of yesteryear. This is a field of scientific study that is growing in use and regard by therapists, counselors and even neurologists and geneticists. It’s fascinating. Hand analysis can bring meaningful insight into our emotional health, our innate life purpose, our outlook, and our overall tendencies, all which can be found in the prints of our hands. The lines in our hands mirror the neural pathways in our brains. How powerful is Scientific Hand Analysis, you might ask? It is so accurate, profound, and life-changing that FORBES wrote an article about Jayne and her work. In our interview today, Jayne tells us more about scientific hand analysis and why it’s so accurate! 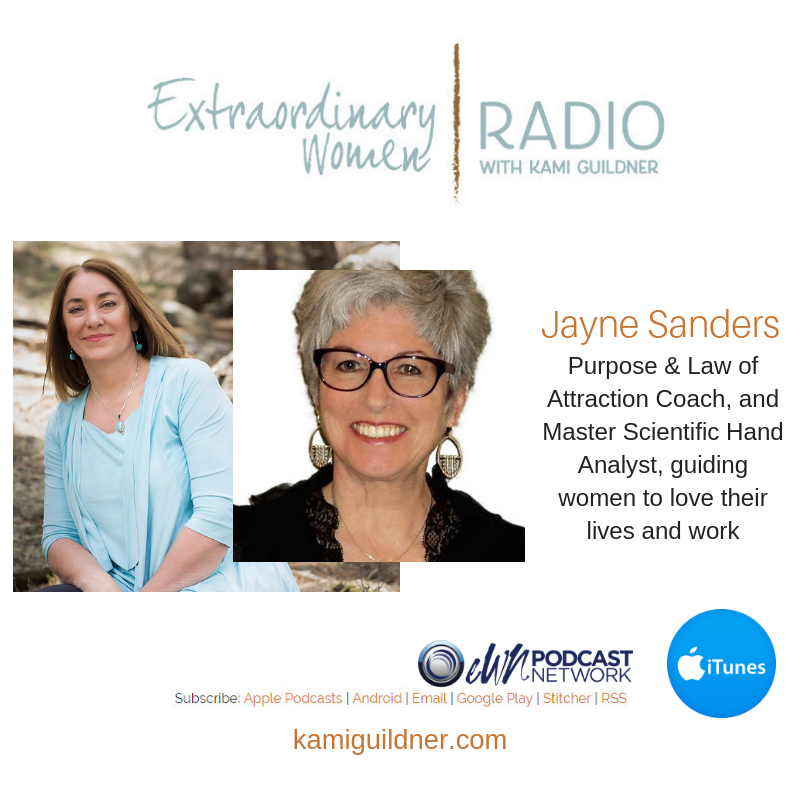 And if you’re at Extraordinary Women Ignite, Jayne will be doing mini-hand analysis in her booth… helping our attendees tune into their purpose and any tendencies that might be getting in the way! And Jayne is one of our speakers who will be igniting the pathway for the extraordinary women in attendance! I hope you’ll be there! Get your tickets before the prices go up! You can learn more about Jayne on her Purpose Wisdom website or Facebook page or follow Jayne on Facebook or LinkedIn. Now, let’s meet the fabulous Jayne Sanders!